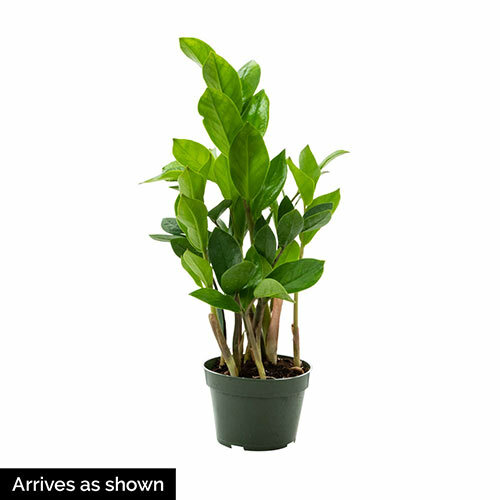 Foliage TypeMultiple long stalks of shiny green leaves that grow out of bulbous rhizomes. Bloom TimeBlooms are very rare and are not very impressive. It will flower in any level of light in mid/late summer and early fall. Flower FormThe flower is shaped like a peace lily; it has one petal that encompasses the flower with one stalk in the center. Soil RequirementsThanks to the ZZ plant's rhizomes which store water, it can stand dry soil for a long time. Do not oversaturate the plant with water. PruningPrune away any yellowing or dead leaves and stems as they appear. The flower can be pruned away with no harm to the plant. If the plant needs to be cut all the way back, it will regrow over time. Winter CareWater the ZZ plant less frequently during the winter months. Additional InformationMildly toxic to pets and humans. Wash hands after handling the leaves to prevent potential irritation. 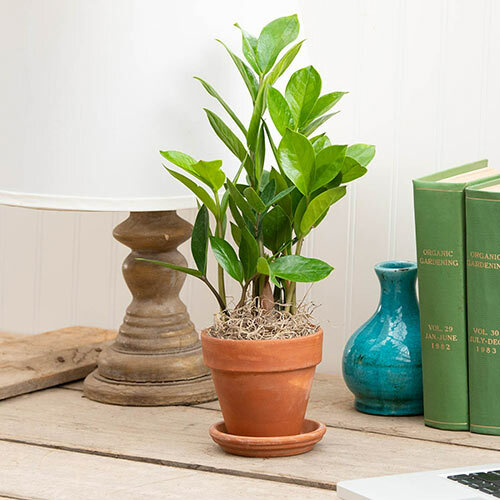 Planting InstructionsPlant the ZZ plant in a new pot at the same soil level when the roots fill out the old pot.